Ready to challenge your brain? Get ready to experience a mental challenge while facing the Labors of the mighty Hercules! “THE LABORS OF HERCULES™” puzzles are themed around the journey of the great Greek hero Hercules. This game consists of four Collections of three Labors each. There is a progression in difficulty from one Labor to the other and from one Collection to the next. Many people have been inspired in various ways from the Greek myth of the Labors of Hercules. The inventors’ inspiration, combined with the company’s “know how” and passion for the brain teasers, is the creative source of “The Labors of Hercules”. The thrilling pattern puzzles which consist of four collections of three Labors each, excite the imagination and enable the players’ minds to explore creative ways to succeed while solving the puzzle of each Labor. TThe puzzles have been designed to provide a distinct and attractive mental challenge for brain teaser lovers. Finding the hidden logic for the completion of each Labor with the help of a few helpful hints, players are encouraged to assume and guess, try and discover, struggle and finally manage to solve the enigma of each Labor! The great joy of solving the puzzle is felt when the secret message in the back of the puzzle tiles is confirmed. The discovery of the secret message, which hints at the moral of the Labor’s story, epitomizes this unique playing experience. An exquisite product deserves a respectively exquisite package! The Hercules puzzles were designed by hand and originate in the home land of Hercules. The packaging has been designed to inspire, inform and complement all four collections. The goal was achieved and a well-deserved Iron Award was awarded. The concept was born in the native land of Hercules, Greece, by a sophisticated inventor, the Chemical Engineer Mr. Spyros Karekos. His fascination with Hercules was reflected, via the design of his son Mr. Ignatios Karekos, on this carefully made pattern puzzle that exudes originality and high attention to detail. Our goal is to acquaint the player with ancient Greek mythology and ancient Greek thought. This project aspires to become a mental challenge for those who love puzzles and cognitive tribulations, as well as a pole of attraction for the lovers of ancient Greek mythology and philosophy. The player, as a contemporary Hercules, is called upon to face a series of mental challenges and to feel satisfaction as he or she successfully completes the "Labors", armed only with his or her mind and perseverance. The Labors of Hercules are aimed at lovers of puzzles and brainteasers, as well as to every man who is attracted to the ancient Greek spirit. The puzzles are based on ancient Greek mythological motifs, ancient Greek geometry, mathematics and logic, as well as linguistic elements derived from Greek history and prehistory. The Platonic and the Archimedean solids, the linear scriptures A and B, the meanders and the architectural rhythms of antiquity are presented as elements that lead to the solution of the twelve Labors. that’s changing the world of cubes! V-CUBES - The Largest Cube Collection EVER! The cleVerCube that’s fun, incredibly challenging and offers endless satisfaction to every user. V-CUBE™ products, which is the core business of a superior range of high quality rotational 3D puzzle cubes manufactured under the unified V-CUBE™ technology invented and patented worldwide by the Greek Engineer Panagiotis VERDES. This breakthrough technology provides an unlimited number of layers, safe and smooth rotation, more durable and user-friendly cubes, new shapes, like the ‘pillow’ design and a pioneering approach to printing borderless and fully personalized cubes. The V-Sphere is an eye-catching, innovative spherical sliding puzzle that will challenge, excite and amaze male and female people of every age! 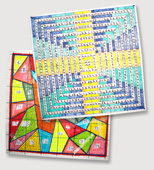 It is a light but sturdy puzzle with permanent vibrant colors and a very smooth operation. Everyone will immediately stick with the sphere once its scrambled and will leave it form their hands only after have it solved! V-Sphere™ consists of 8 fixed colored spherical triangles. The 7 of them are surrounded by 12 colored moveable rectangular pieces while the latter triangle is surrounded by 11 pieces, leaving always an empty space. This space helps the user to match the rectangular pieces to the fixed triangles of the same color, while sliding the moveable parts around the sphere. The sophisticated puzzle concept combined with the highest European manufacturing quality, warranties the ultimate user satisfaction. "V-CUBE cleVer Brain Teasers are available in 105 countries in every corner of the globe! The sincere effort to offer innovative puzzles and games to the customers worldwide continues with passion and inspiration sourcing from them! " Verdes Innovations S.A. was founded in 2008. The company is the sole producer of the V-CUBE™ products, a superior range of high quality rotational puzzle cubes manufactured under the unified V-CUBE™ technology, invented and patented worldwide by Greek Engineer Panagiotis VERDES. Each cube gives an impetus to exercise and increase the player’s mental fitness and offers constant amusement & challenge! Furthermore, the brand offers unique custom printed “theme” products to some of the world’s most famous museums and corporations. During 2017 Verdes Innovations S.A. has broaden the product portfolio and introduced the patented V-SPHERE™, a sliding spherical puzzle and “The Labors of Hercules™” a challenging serious of four collections containing three unique pattern puzzles each. The company is located in the Korinthos prefecture of southern Greece and it consists of five divisions; R&D, production, sales & marketing, logistics and administrative assistance, of which all strive toward excellent quality control and customer service. The worldwide authorized network of V-CUBE dealers, ensures customer satisfaction providing high standard of services associated with the V-CUBE brands. The company’s philosophy is customer oriented. The EU manufacturing quality is of the highest ISO standards. Furthermore, product innovation and continual introduction of novelties is of prime importance, in order to safeguard consumer’s satisfaction. We have been voted as #1 Innovating Company in Greece in 2010 by the Greek Department of Research and Technology, recognized as a National Champion for Greece in the European Business Awards 2013 and the Premier Export Start-Up Company in the Greek Export Forum 2013. Our products have also received several awards including a Gold award in the Creativity International Awards 2011 and a Silver award in Pentawards 2011. Since 2008, the company sales has grown impressively exporting from EU-Greece to more than 30 countries via a well established and fast growing network of distributors. Moreover our products have reached 112 countries via the web. V-CUBE™ has already become a very popular Global Puzzle Brand and our newest novelties have already had an enormously warm reception.